Directed by Tamer El Said. Starring Khalid Abdalla. This film within a film is a haunting, lyrical chronicle of recent years in the Arab world, where revolutions seemed to spark hope for change and yield further instability in one stroke. Khalid Abdalla (The Kite Runner, The Square) plays the protagonist of Tamer El Said’s ambitious feature debut, a filmmaker in Cairo attempting to capture the zeitgeist of his city as the world changes around him—from personal love and loss to the fall of the Mubarak regime. Throughout, friends send footage and stories from Berlin, Baghdad, and Beirut, creating a powerful, multilayered meditation on togetherness, the tangible hold of cities, and the meaning of homeland. Shot in 2008 and completed in 2016, the film explores the weight of cinematic images as record and storytelling in an ongoing time of change. Tamer El Said is a leading documentary filmmaker, political activist, and key figure of Egypt’s independent film industry. This is his first fiction feature. 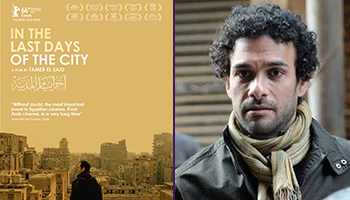 Since its world premiere, IN THE LAST DAYS OF THE CITY has been praised by both international and Arab critics, and included on a number of lists of best films of the year, including the Critics Award of the Best Arab Film in 2016. Other awards picked up by the film include the Grand Prix of Festival des 3 Continents - Nantes in France; the Grand Prix of New Horizons International Film Festival in Poland; and Best Director Award at the prestigious Buenos Aires International Film festival (BAFICI) in Argentina, among others. New York Times: "... this is a film of beauty and skill." Los Angeles Times: "A soulful, atmospheric travelogue that toggles between immersing in and removing itself from the chaotic beauty of teeming humanity, El Said's movie gives a humming, on-the-edge metropolis its heart-pumping, reflective due."